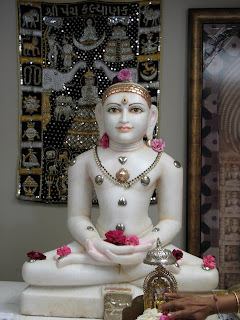 Lord Rishabhdev also known as Lord Adinath was the first Jain Tirthankar of present time cycle. He lived before civilization developed. Because of this, he had the name of Ādināth - the original lord. He became a Siddha, a liberated soul which has destroyed all of its karma. Rishabha was born to King Nabhi Raja and Queen Marudevi at Ayodhya in the Ikshvaku clan. According to Jain beliefs, Rishabh existed before civilization developed. He taught people agriculture, tending of animals, cooking, and more. He had one hundred and one sons. His eldest son - Bharat - was a chakravarti king - the conqueror of the known world. In the later part of his life he retired to become a monk and attained moksha. Because he became a siddha, he is occasionally worshipped. According to Jain beliefs, India was named Bhārata-varsha or Bhārata after him. His second son was Bahubali, whose statue stands at Shravanabelagola, Karnataka as well as at Karkala. Marudevi mother of Adinath was the first person to achieve liberation - even before Rishabh himself. Rishabh's grandson Marichi's soul later became Mahavira. Lord Rishabha attained omniscience or infinite knowledge at Palitana (Gujarat) and attained liberation (Moksha) at Ashtapad mountain in Himalayas. Rishabha is mentioned in the Hindu text of the Bhagavata Purana as an avatar of Vishnu. He is mentioned in all the Vaishnava/Shaiva Puraņas, as well as in some other texts. According to the Bhāgavata, he was born to show the people of this world the path of salvation. It was he who advised the people to follow the path of eternal bliss, instead of indulging in a life of worldly pleasures and enjoyment. He is the founder and promoter of sramanic culture. In the depth study of the vedas and puranas, which contain numerous references to Rishabha. The Bhagavata Purana says: In the womb of Merudevi, wife of Nabhi, Rishaba had his eighth avatara. He showed himself in a form that is to be worshipped by those in any stage of life. Bhāgavata calls him "शरीर मात्र परिग्रह " (body his only possession), "गगन परिधानः " (wearing the sky), वातरशना (wearing the wind). In his previous incarnation, Lord Rishabha Dev was in the mahavideh shetra as Dhannaseth. He was a big business man. He offered alms and services to many ascetics and others. Later he completed 7 births as Dev and humans. He was then born as Vaidya Jivanand in his 9th incarnation. As Vaidya Jivanand he discovered a medicine for pandu rog (a dreaded skin disease). In his 11th incarnation he was born as Chakravarti King Vajranabh. As King Vajranabh he had supported poor and desolate masses. After many years of public service Vajranabh renounced the world and became an ascetic. As a result of unprecedented spiritual practices, including religious studies, penance, tolerance, and meditation, he earned Tirthankar-nam-and-gotra-karma. These pious deeds of earlier births resulted in his taking birth as Rishabha Dev. It was during the last part of the third Ara of the current descending cycle of time that the great and pious soul that was to become Rishabhdev descended into the womb of Marudevi on the fourth day of the dark half of the month of Ashadh (according to the Hindu calendar) during the night. When this pious soul was conceived, mother Marudeva dreamt of fourteen (sixteen according to Digambara Jain Sects) auspicious things. Nabhiraja was an experienced and scholarly person. When he heard about these dreams from Maudevi, he said, "Oh queen! You will give birth to a highly endowed soul who will show the path of peace and happiness to this world". Shreyans Kumar was sitting in the balcony of his palace and brooding over the dream he saw last night. All of a sudden he heard the noise caused by happy masses who had seen Rishabha dev entering the town. Thousands of citizens of Hastinapur rushed toward Rishabhdev with gifts. Rishabhdev did not even look at these things and continued his graceful walk in the direction of the palace. When Shreyans saw approaching Rishabha dev, he rushed to welcome his great grandfather. After bowing down at the great ascetics feet when Shreyans looked at Rishabha dev’s face he could not shift his gaze. He went into a state of meditative thoughts and suddenly he acquired Jati-smarana Gyana, the knowledge that opens up memories of the past births. In his past birth Shreyans was the charioteer of king Vajranabha (the past incarnation of Rishabha dev). This knowledge also made him aware of the duties of laity toward Shramans. He realized that Bhagavan Rishabha dev had been wandering around without food or water due to the prevailing ignorance of the people regarding ascetic norms. nice document to educate indians about great saint .visit Maharshi Institute of Life Management page on face book and mark to get regular updates. We are also trying to reach more and more people especially youth, we wish people who wish to support usvisit Maharshi Institute of Life Management page on face book and mark to get regular updates. Nice to read it.. Great Work !!!!! very nice and inspiring highlights on JIN SHREE RISHABHDEV JI 1st TIRTHANKAR MAHARAJ. JAY JINENDRA, NAMASKAR. 🙏🙏भगवान श्री ऋषभदेवजी, प्रथम तीर्थंकर के जन्मोत्सव पर हार्दिक अभिनंदन!! Bhagwan ke inlaws ke name kya hai. Unki wifes ke father mother ka name. which jain God spend less time in mother's womb?